If you’ve ever heard a variation of that question from your students—or asked it yourself—this book is for you. Bringing technology into the classroom is about so much more than replacing overhead projectors and chalkboards with Smart Boards. Unfortunately, as Stanford Professor Jo Boaler says, “We are in the twenty-first century, but visitors to many math classrooms could be forgiven for thinking they had stepped back in time and walked into the Victorian era.” But that’s all about to change . . . 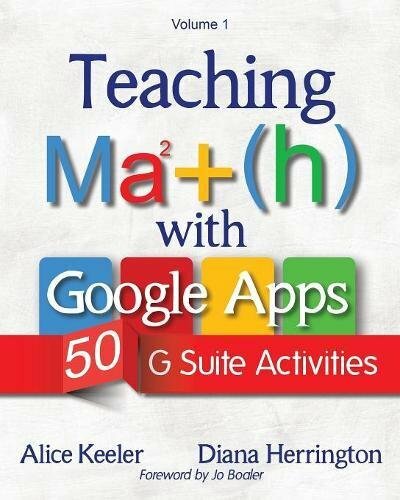 In Teaching Math with Google Apps, author-educators Alice Keeler and Diana Herrington reveal more than 50 ways teachers can use technology in math classes. The goal isn’t using tech for tech’s sake; rather, it’s to help students develop critical-thinking skills and learn how to apply mathematical concepts to real life. Memorization and speed tests seem irrelevant to students who can find the solution to almost any math problem with a tap of the finger. But today’s digital tools allow teachers to make math relevant. Specifically, Google Apps give teachers the opportunity to interact with students in more meaningful ways than ever before, and G Suite empowers students to stretch their thinking and their creativity as they collaborate, explore, and learn. 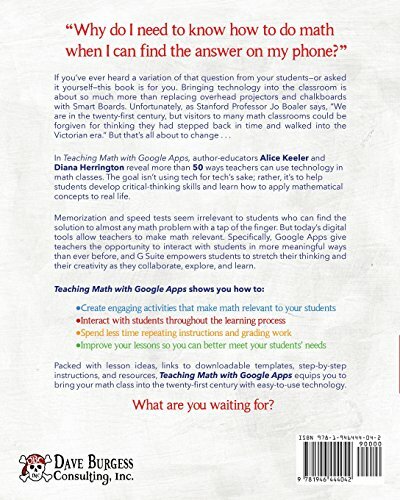 Packed with lesson ideas, links to downloadable templates, step-by-step instructions, and resources, Teaching Math with Google Apps equips you to bring your math class into the twenty-first century with easy-to-use technology. What are you waiting for?